If you're a breastfeeding mom you (just like I did) probably have some crazy cravings. 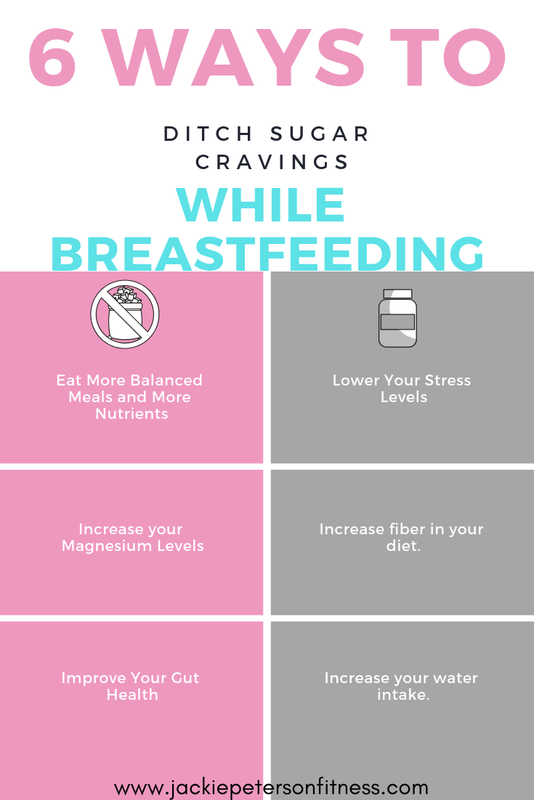 Sometimes our breastfeeding cravings are 10x worse than pregnancy cravings (it seems like they are never ending)! But instead of craving pickles and oranges and ice cream you are craving well, EVERYTHING. Carbs, cookies, crackers, chocolate, chocolate, oh and did I mention chocolate? My sugar cravings were at an all time high while breastfeeding. But it doesn't matter what it is that you're craving whether its sweet or salty, these cravings are super hard to curb. So many women think that this is just part of normal life while breastfeeding and there's nothing we can do about it but from what I've learned on my own journey is that is a lot more we can control that we think! These cravings actually might be a sign that something in our body is "off". With all the hormonal changes we go through during this time in our life, it absolutely makes sense! 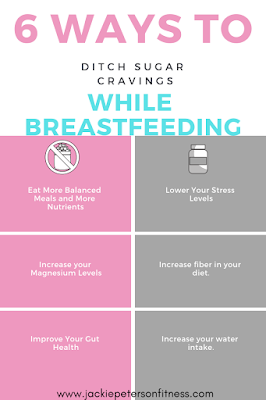 If you are having lots of cravings while breastfeeding my advice is to not ignore them, but simply get proactive to find the solutions! Your body is much smarter than you think. More than likely these cravings are a warning signal and your body is telling you that it is in need of some additional support. 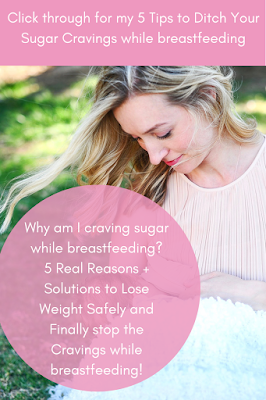 Here's 5 Reasons You Might Have Cravings While Breastfeeding and 6 Ways to DITCH them for good! 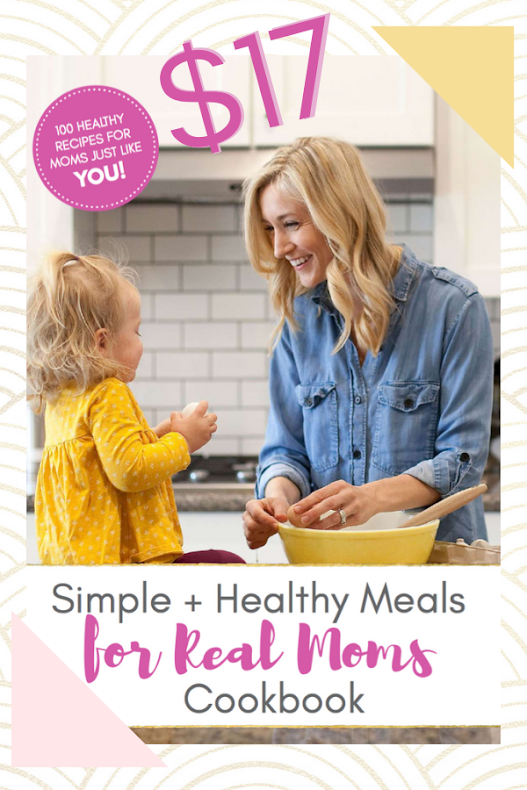 As busy breastfeeding moms its really easy to just grab for the most convenient foods in the pantry but more than likely if you're having lots of cravings it's your body telling you that it needs those gaps filled with quality protein, healthy fats, complex carbs and lots of good dense nutrients. If you're under eating in any of your macro nutrients (fats, carbs, protein) its likely that your body is telling you that you need more. Eating 3-4 balanced meals per day with the an adequate amount of calories is really key when it comes to feeling satiated and ditching the cravings. While I'm a huge proponent of getting all my nutrients from whole foods, its really difficult for us to get enough magnesium just from the foods that we eat. The magnesium levels in our foods are very low compared to hundreds of years ago because of industrial farming. If you're having cravings there's a chance you may be low in magnesium. In fact 80% of Americans are deficient in magnesium and its known that magnesium depletion often happens due to stress and sleeplessness. Both of these lifestyle factors are very common for new moms and so its very typical for a breastfeeding mom to be low in magnesium. "It’s recommended that pregnant and breastfeeding women get 20% more magnesium per day than the average person. Since the body can’t create magnesium, it has to come from outside, so breastfed babies have to get it all from breastmilk. Eileen Behan, R.D., in her book on nutrition and breastfeeding, says that breastfeeding mothers consuming fewer than 2200 calories a day are probably not getting enough magnesium, no matter what they’re eating." You can check with your doctor to see if you're deficient in magnesium (or any other vitamins) that may be causing you to have cravings. Low magnesium levels can also be a reason you're feeling fatigued or having trouble sleeping. I personally take a magnesium supplement at night to help me sleep sounder and it has been a game changer. 3. Your stress levels are too high. Demands of motherhood, career, caring for other children, relationships, sleepless nights and more can be a huge reason you're having cravings. Stress eating is a huge problem for so many women who are chronically stressed. The feeling of relieving that pain with food (for a few seconds of pleasure) can certainly be enticing but its really doing your body more harm than good. This isn't just about reducing cravings its about taking care of your mental health! With all the demands we have as modern moms its no wonder our stress (and therefore cravings) are at an all time high! My advice is to do everything in your power to lower your stress levels and please STOP being afraid to ask for help! It takes a village. 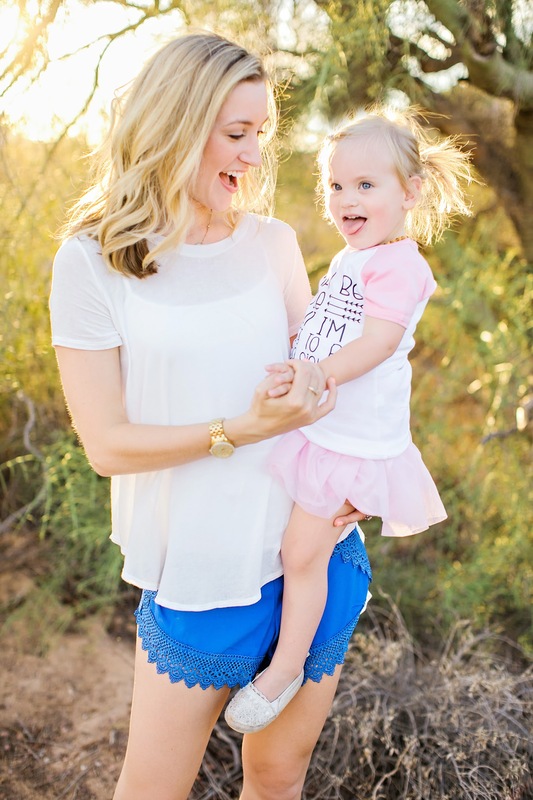 When I finally gave up control and started asking for help is when I was finally able to enjoy motherhood again. 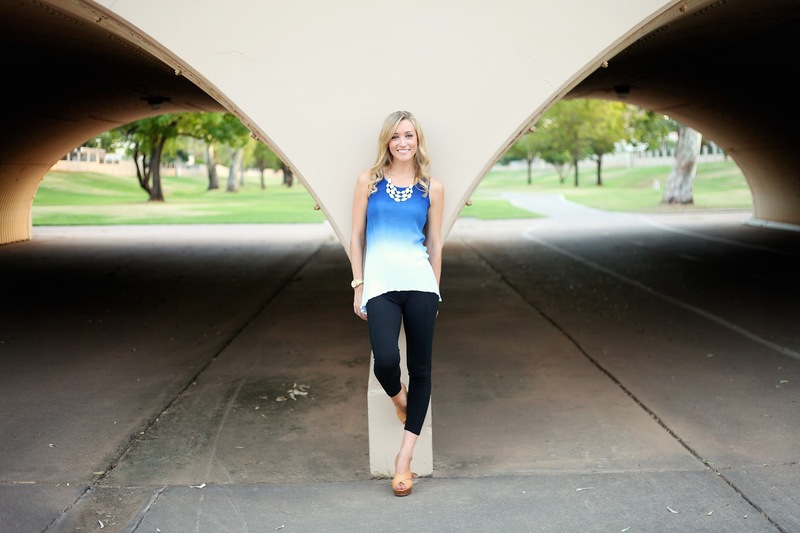 Here's some practical ideas for lowering you stress levels. - Have a conversation with your spouse or partner so they can help you more with the baby and around the house. - Hire a babysitter or mother's helper. - Start getting groceries delivered. - Meditation or prayer first thing in the morning for a few minutes. - Prioritize a weekly or monthly date night with your spouse. 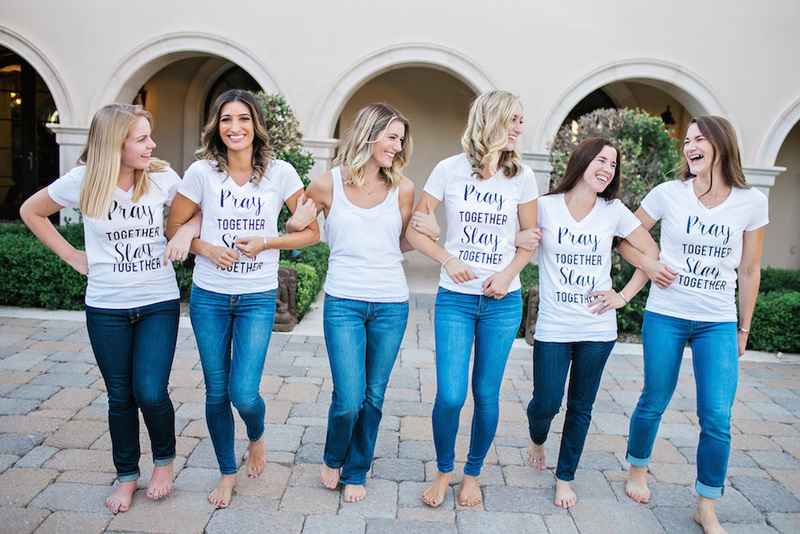 Self care might not seem important because as women we are so conditioned to take care of everyone else but ourselves, but if your stress levels are chronically HIGH its VITAL to your health and the health of your family! 4. Your gut health is poor. Everything begins in the gut. If your gut bacteria is compromised this is a huge reason why you may be experiencing such terrible cravings. If you want to know all the science behind why this happens you can read my blog post here. Your gut bacteria can become unhealthy due to lifestyle factors (stress, exhaustion, nutrition choices, etc) and once its compromised it can cause something called leaky gut. This causes a whole host of other symptoms (read more here) that can wreak havoc on your body and immune system as well as cause terrible cravings + weight gain. The bad bacteria inside your gut thrives and survives off sugar so it sends signals to your brain to consume more. It quite literally may not be your fault that you're having cravings it may just be your gut signaling to your brain so this bad bacteria can thrive. Reducing stress in your life as well as moderate exercise and good nutrition choices can help to restore your gut bacteria to a healthy state and ultimately stop the cravings. Eat foods rich in probiotics (like kefir, kombucha, kimchi, sauerkraut, bone broth, etc), consider supplementation with a probiotic and digestive enzyme and learn how to heal and restore your gut. If you want to dive deeper into this topic read my blog post with my 5 Steps to Heal Your Gut here. Sometimes when we don't eat enough fiber or when we are dehydrated it can leave us feeling hungry even after we just ate. Adding more fiber rich foods like broccoli, lentils, beans, chia seeds, avocado, and fruit can be a great way to add more fiber into your diet. Drinking enough water is also vital to helping you curb cravings and stay satiated in between meals. How much water should you be drinking? Rule of thumb is to divide your body weight in half and drink that many ounces of water each day. So for example, if you weigh 150 lbs you should drink roughly 75 oz. of water each day. I also recommend drinking above and beyond that for breastfeeding moms who can become more easily dehydrated (closer to 100-120 oz per day). 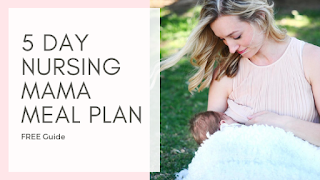 I hope that these tips are helpful in your breastfeeding and weight loss journey. 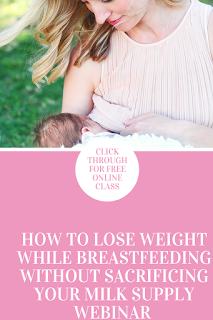 To learn more about how you can successfully lose weight SAFELY while breastfeeding grab a copy of my 5 Day Nursing Mama Meal Guide here or join me LIVE for my next "How to Lose Weight While Breastfeeding" Webinar here.